A Silver base facial for all types of skin. Special effects in pigmented skin. The gel made from real silver & aloe-vera which cleans the skin deeply. Rub gently for 5-7 minutes on the face & clean with moist cotton. Benefits of Asta Berry Silver Facial Kit : A traditional Ayurvedic facial that incorporates the cooling and rejuvenating properties of pure silver to rescue and tame stressed out skins, calming and soothing the most sensitive of complexions while giving the skin a nourishing boost. We offers fine quality Silver Facial Kit to our most reliable customers which are situated all round the nation. 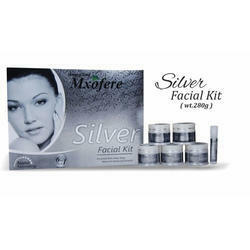 Our Silver Facial Kit are widely available at market leading as well as competitive prices. Pure silver dust & numerous herbal extracts cleanse away all dirt & impurities from the skin surface, while keeping your skin soft & supple. Active Ingredients: Pure Silver Dust, Aloe Vera Extract, Sandal wood Oil, Grape Seed Extract. SENSKIN Silver Facial Kit treats your skin gently while giving you that ultra-glow and bright complexion. It purifies and detoxifies your skin and leaves your face bright beautiful. Precious metals have the capacity to attract and dispel positive or negative energies. Silver is good for both Pitta and Kalpa. Ayurveda also uses oxidized and precious metals in medicines called "Basmas". They go deep down into the body and helps in rejuvenation. Silver Facial Kit: Specially metallic facial for all types of skin. Specially formulated with silver chest and aloe vera to remove black heads and white heads with gives tightening fairness effect. Our products are adored by people across India owing to being effective despite lacking side-effects. Make our products an indispensable part of your daily life, and we assure you that you will testify that our claims are veracious. The Silver Kit has a rich blend of silver that acts to improve the balance of the cell renewal process and shine of skin. It helps to mitigate blemishes and acne scars. It removes dead cells, black patches and spots to vie you fairness and tightening of the skin. This Kit is suitable for all skin types. Keeping the diverse requirements of customers in mind, we are instrumental in providing Silver Facial Kit. We are looking for dealership and distributorship enquiry . Swarn Magic Silver Facial kit is a modern day technic, that offers pampering & relaxing experience allowing you to unwind, escape and fully rejuvenate. Use of traditional aroma oils awakens the muscles & eases you back into the day.